I had so many requests from you to make a Boccone Dolce video. So here you go my very first video just for you! I’ve made it at home many times since and it always turns out great! Tall, solid and stern. This particular recipe doesn’t call for the last-minute assembly, but rather, should be assembled about 5 hours before serving to prevent cracking during cutting. For detailed picture instructions check our my original Boccone Dolce Recipe. All the ingredients are the same except you don’t need Nutella and dolce the lecher for the cream. Preheat the oven to 350 F. Place a 10” bottom piece of a springform pan on a sheet of parchment paper. Trace the circle with a pencil. Cut out the circle 2” further away from the traced marking. Make 3 identical circular cut outs and set them aside. Carefully separate egg yolks from whites. Place all 12 egg whites into an electric mixer bowl. Add sugar. Beat egg whites and sugar on high for about 15 minutes. (Speed 10 on a heavy duty 6000 HD Kitchen Aid Mixer. Beating times vary depending on the mixer you use.) The thickness of the meringue is very important. It should be very thick, heavy, and smooth (with no sugar granules). Fill a piping bag with meringue, about ¾ full. Turn over the circular parchment paper cut outs (so the pencil mark is on the bottom side). Pipe meringue out in moon shapes (reversed letter “c”) overlapping each other to form a large circle along the visibly traced circle. Then fill in the middle. Level out the inside meringue, leaving the outer circle untouched. Repeat the same steps with all 3-parchment paper cut outs. Trim one of the previously used parchment paper cut outs along the traced circle and place on the serving platter to assemble the cake on. (This is optional but handy to prevent the platter from scratches during slicing). Spread a smidgen of cream under the paper to prevent the cake from sliding off. Place the first meringue layer on the paper. Fill about 1/3 of the cream into the same piping bag with the same tip you used to pipe meringue. Pipe out the cream in the same manner as the meringue layers. Spread out and mix up (rinsed, dried and cut) fruit on top of the cream. (As you can see I love a lot of fruit.) Then place the second meringue layer on top of the fruit and repeat the same steps. Finally, place the third layer on the second, repeat the steps once more and top it off with a nice load of fruit! Also, you can watch this recipe video on my YouTube channel HERE. If you enjoyed this video give me a big thumbs up, and don’t forget to SUBSCRIBE to my YouTube channel, be sure to click the Bell icon so you can be the first to know of a new video release! If you make this Very Berry Boccone Dolce Cake Recipe please share a picture with me on Facebook, Instagram or Pinterest. Tag with #valyastasteofhome. I’d love to see your creations! ? This cake looks amazing but its impossible to watch the video there seems to be an advertisement/commercial every 15 seconds. Very disrupting! Hi, dear! Very Berry Boccone Dolce Cake Recipe YouTube video in this post has no advertisements at all. I sent you a private email. I’m so sorry for any inconvenience this caused you. Hi! Can I use regular sugar for this cake recipe or does it have to be bakers sugar only ? Yes, regular sugar is fine. Make sure you beat a little longer than recipe calls to. You can actually make baker sugar yourself. Place sugar into a food processor and process for about 30 seconds. Do you mean assemble the meringue layers the night before? Here is what I do: I bake the meringue layers in advanced (that could be done a couple of days before the event), then the night before the event I pipe the cream and place the fruit. And then about 4 to 6 hours before the event, I stack (assemble) the layers on top of each other. This is because berries have juice and it will moisten the meringue layers. 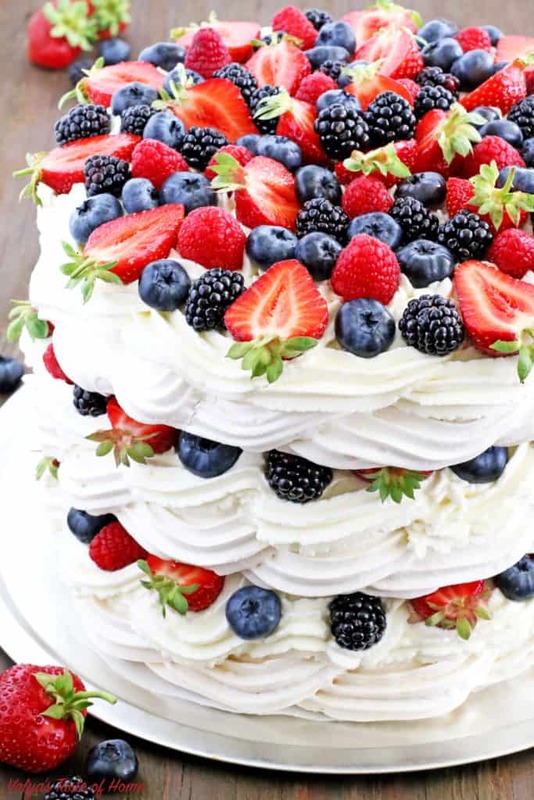 Being assembled for 6 hours before the event means that the meringue layers get enough moist from the berries and cream that it’s not too crunchy and not too soft. This saves so much time and you will end up with the perfect Boccone Dolce cake. I hope that clarifies more. Let me know if you have more questions.